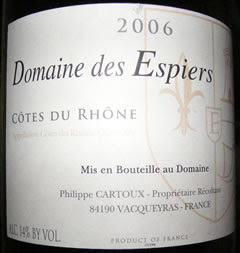 This one came from Jill over at Domaine 547 and what a great value for $14.99! Mainly dark berry aromas but there were also smoky, meaty components as well as a small trace of fertilizer. Lots of deep, ripe plum and berry fruit on the palate, underlain by spice, white pepper, cranberry and mineral components. I just wanted to keep taking in the aromas, then keep rolling the wine around in my mouth to savor all the flavors. This wine was well balanced and had a nice, long aftertaste. Jill describes the wine on her web site as, "..intense, flavorful, dark and oh-so drinkable." I completely agree - this was really, really good. Two thumbs way up for this one! Here's the matching YouTube video, something with a lot going on to match the wine that has a lot going on. Click here if you can't see it below.